Reusable sanitary pads are something that I've been toying with trying out for a long time, but I just kept putting it off. Thankfully, I've started to see several women who I follow via blogs and Youtube, talking more about them recently, which has helped to somewhat 'normalise' the idea of reusable sanitary protection in my mind. It's bizarre, isn't it? Ever since I started my periods, I've been conditioned to think of sanitary protection as merely these disposable things that should be wrapped up discreetly and binned after use. Out of sight, out of mind maybe? I remember my mum walking with me to Boots so that I could purchase a pack of Always pads and a Clearasil skincare starter set - two items that symbolise a 'rite of passage' into the beginning of womanhood for so many young girls. It was all so embarrassing and I remember trying desperately to avoid eye contact the (female!) sales assistant at the checkout. Then came the trauma of tampons slightly later on; that whispering in the girl's bathroom to your best friend in the cubicle next door, "how does it go in?! ', and the tears that followed afterwards when you think that there's something 'wrong' with you because it feels so unnatural to have an item jammed up there, as well as the anxiety and sheer horror that I felt when I first read about TSS (Toxic Shock Syndrome). Needless to say, periods and sanitary protection weren't something that was discussed openly in my home or at school. My mum tried her best, but she was as embarrassed talking about it, as I was listening to her. I don't ever recall the subject coming up at school, other than in the context that you had to tell the P.E teacher (in front of everyone) that you were 'on', so you could be excused from having a shower - they even had a period register for it! I didn't have many female friends at school except my best friend, who was usually too shy to talk about things like periods with me, and my sister is much younger, so periods and what sanitary protection should be used was something that I had to largely figure out for myself. How I wished the internet and social media was a bigger thing back then! Fast forward to 2018 and the world seems to have changed so much. There are now national campaigns to address the unnecessary stigma and embarrassment around periods, and there are charities that deliver sanitary pads and tampons to schools so that young girls don't have to suffer from period poverty (where girls skip school because their families can't afford to purchase sanitary protection - yes this happens sadly here in the UK). Nowadays, you can even get period subscription boxes delivered straight to your door every month too - I would have loved one of those as a teenager! We haven't managed to abolish the ridiculous Tampon Tax yet, but The European Commission says it is aiming to bring in a zero rate for sanitary products this year and the UK government has already legislated to allow this to happen as soon as the rules change, according to the BBC. Throughout all of these progressions, debates have started to rise up regarding the huge amount of waste that's generated by using disposable sanitary protection, most of which either ends up in a landfill or finds its way into the oceans causing further pollution problems there. Slowly, I've started to see women open up about periods and the products that they use via social media, blogs and YouTube, and as many of us are trying to do our bit for the Environment, reusable sanitary options make so much sense. I've tried Moon Cups and Diva Cups, but neither worked out for me as a long-term solution, so it was time to test out some reusable pads. Bloom & Nora very kindly sent me one of their trial packs to try out and here's how I got on! The Bloom pads feature an absorbent core that's made from a soft surface layer of natural Bamboo fibre (and this feels SO soft against your most delicate parts - honestly, it's really nice not to have something plasticy down there!) and two layers of Polyester Microfibre. There's also a unique stay dry binding which provides a resilient barrier against leaks and locks everything away in the absorbent core, whilst the outer layer is waterproof for extra protection and peace of mind. The trial kit includes four sizes; Mini (light flow), Midi (regular/medium flow), Maxi (medium to heavier flow), and Mighty (heavy flow, night & postpartum use). Each size is available to purchase individually or in packs of three. For my body shape and needs, I found the Mighty pad to be much too large for me, so I used the Maxi size as my night time pad instead. I'd recommend checking the sizes/lengths on the website before ordering if you are a more petite woman. The poppers on the outside attach neatly to your underwear and I found the pads were very comfortable to wear; they stayed put and I didn't experience any problems with them - no leaks, no disposable/plastic 'rustling' noise, no discomfort. I was so nervous at first about wearing them outside of the house, but I needn't have been. They did the job perfectly and I felt fully protected at all times. I found the pads to be a lot more absorbent than disposables, and I particularly noticed this on heavier flow days - I definitely needed less trips to the loos throughout the day which was appreciated and I only needed to change the pads after a few hours of wear. I've never been one to buy fragranced/scented disposable pads, but for those who are curious, I didn't notice any 'bad smells/odours' from using these. I followed the info on the Bloom & Nora website and washed them as normal in non-bio liquid with the rest of my laundry, but without any fabric conditioner, as this will coat the fabric fibres of the pads and reduce their absorbency. I generally wash everything on the standard eco setting on my washing machine which is pre-set at 30 degrees and I didn't experience any problems - they came out perfectly clean. To prevent any staining, I gave them a quick pre-rinse in the sink with cold water before putting them into the laundry (never use hot water as this sets stains). The pads are fast-drying, so you don't really need to tumble dry them (they can change shape if you do). Instead, I popped them onto the radiator to air dry naturally. The Trial Kit comes with an Out & About Bag which I found very useful! 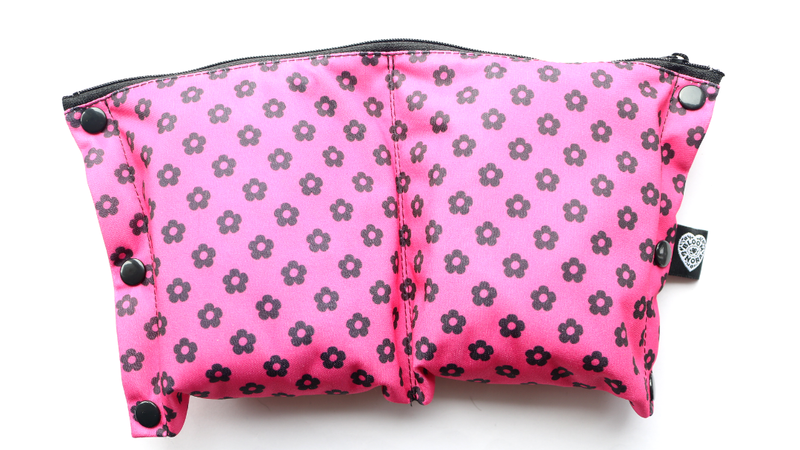 It has two separate waterproof sections so that you can easily store your clean and used pads without any fuss. Wash the whole bag with your used pads and you're good to go! 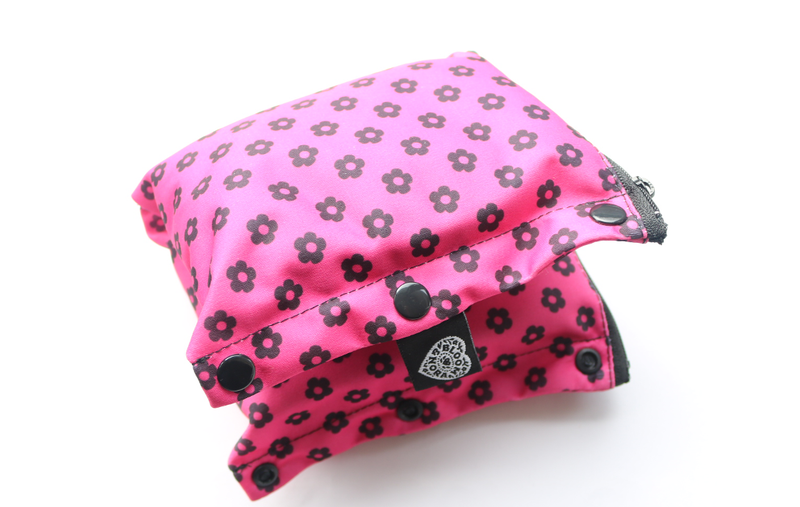 There are even convenient little poppers on the sides so that it can be folded down into a more compact size, and this bag will store 4-6 pads. I'm so happy that I had such a positive experience with these Bloom & Nora pads and I'll definitely continue to use them. During my trialling of these, I did use some disposable pads alongside them as the kit only contained four pads, so I'll certainly be ordering some more for next time. I think the only time that I would now use disposables are for holidays and longer trips away where I wouldn't have access to a washing machine, but for every other time, I'll be sticking with these! Have you tried reusable sanitary products before?